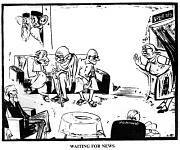 Waiting For News – 1945. Can The Ship Run Without Jinnah Saheb? 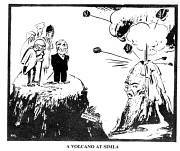 A Volcano At Simla - As the result of the Volcano eruption at Simla the Wavell plan has been wiped out by its lava. – 1945. Nuts To Crack – 1946. Holding Up The Train - Shankar, India, 1946. Go Home Before It Is Too Late – 1946. Have You Got It? – 1947. Can We Help – 1947. The Martyr - The Pioneer, India, 1948.